Iraqi police and soldiers on Saturday launched major raids in a once-notorious insurgent stronghold west of Baghdad. A police official in the Anbar province city of Falluja told CNN that a large number of security forces were scouring its Sinaie district for an array of weapons — machine guns, mortars, rocket-propelled grenades and small arms. The Sinaie area, in Falluja’s southeastern section, is an industrial district with factories, scrap yards and large, abandoned yards. The area used to be a stronghold of the insurgency in Falluja until the militants were driven out in major military operations five years ago. At that time, the U.S.-led offensive was largely in response to the brutal ambush, killing and mutilation of four U.S. security contractors. Their charred bodies were left dangling from a bridge over the Euphrates River in spring 2004. In November of that year, U.S. and Iraqi forces attacked insurgents in Falluja, killing about 1,200 militants. 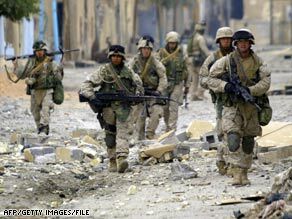 Eight Iraqi soldiers and 51 U.S. troops, mostly Marines, died in urban combat, according to the Pentagon. About 95 percent of Falluja’s population was displaced. Falluja is about 37 miles, or 60 kilometers, west of Baghdad After the city was pacified, the United States committed more than $200 million to reconstruction projects there, and changes became evident. Small cafes and grocery stores lined the streets once dusty and abandoned. Iraqis in Falluja got back to the rhythms of everyday life: They worked, shopped — and rebuilt. As fragile security gains took root, American military officials marveled at the resurgent city of several hundred thousand. On Saturday, a police official denied reports that armed groups were trying to re-establish a foothold in the area. The U.S. military said Marines and police in the nearby town of Karma were also participating in a combined cache sweep. Violence has dropped in Iraq, and President Obama’s administration has been gearing up to withdraw U.S. troops. The U.S. military continues to be on guard for flare-ups in violence and insurgent activity. The vast and predominantly Sunni Arab Anbar province was a battleground between the U.S. military and al Qaeda in Iraq during the earlier years of the Iraq war. But the insurgents eventually lost ground when a grass-roots movement called “the awakening” emerged. The tribe-based awakening forces rejected al Qaeda in Iraq and turned their allegiances toward the U.S. and Iraqi government. While the awakening doesn’t have clout in Falluja, there are pockets of support just outside the city, as well as in the rest of the province. Al Qaeda in Iraq’s strongest presence in the country is now in the Mosul area, in Nineveh province, north of Baghdad.